Lay on flat sheet pan covered in foil. Melt 3/4 cup dark chocolate or cacao chips. I use Lily’s brand sweetened with stevia. Add 1 Tbsp unrefined coconut oil to the hot, melted, chocolate, and stir. This thins it out & makes it smooth. 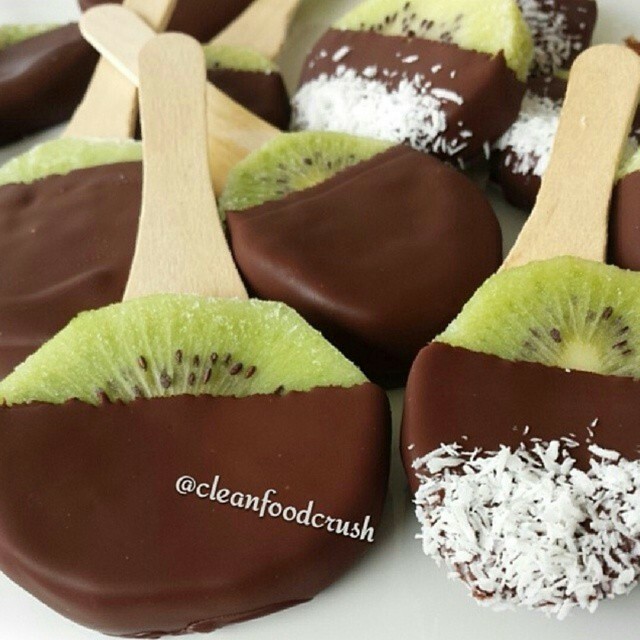 Dip frozen Kiwi in the melted chocolate. They harden almost immediately. I sprinkled several with unsweetened shredded coconut. Serve immediately, or wrap in plastic & refreeze.